I was looking at some Union Silver coins bought as part of one lot and minted in the same date albeit of different denominations and noticed that die cracks are quite common. 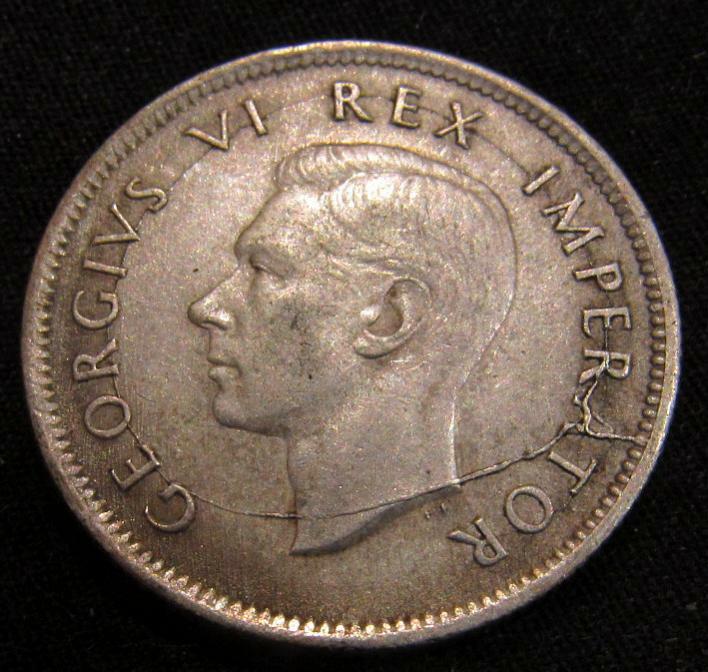 These cracks are usually found on the OBVERSE in the periphery of the coin and also along the outside of the Legend sometimes forming a "bridge effect" (see pic of Obv 1943 2 Shilling).The Reverse seems to be spared (rev of the 1943 Two shilling shown) and this points to more often changing of the Reverse die. There are people who consider these coins as the last issue before the die change because a die that is cracked will supposedly soon break. I am not sure if this is true. The people who did the minting in that period are all long gone and records adress coin mintage mainly. I dont often see this phenomenon in Copper coins and almost never in Gold although a 1900 ZAR Pond with a noted die crack was offered for sale as if it was the last ZAR pond ever minted by the ZAR Mint before British takeover. Perhaps Gold being softer did not stress the die as much and the same die was used for the Obverse in the years 1892 to 1900 with obvious flattening of the hairline as years wore on despite no circulation. Apart from die cracks, what is seen in almost every Union silver coin is die scrubbing marks that point to reconditioning of dies between mintage of batches.They are fine usually vertical reverse scratch marks that have overlying lustre. These are seen in the pics as well. The Modern Nickel and Silver coins do not show such imperfections and we have lost the rather attractive individualisation of coins to be replaced by a unidimensional sameness in the modern period as technology improved. Hows this for a monster die crack. Wow, never seen that before.